Landscaping can be expensive – ridiculously expensive. We all love the idea of updating our yards from time to time (but without going broke, thanks) to keep our homes beautiful and tasteful. Believe it or not, there are tons of inexpensive landscaping options that can transform your dull backyard into a gorgeous retreat. In this article, we’ll be going over 21 of our favorite backyard landscaping ideas on a budget (with pictures!). 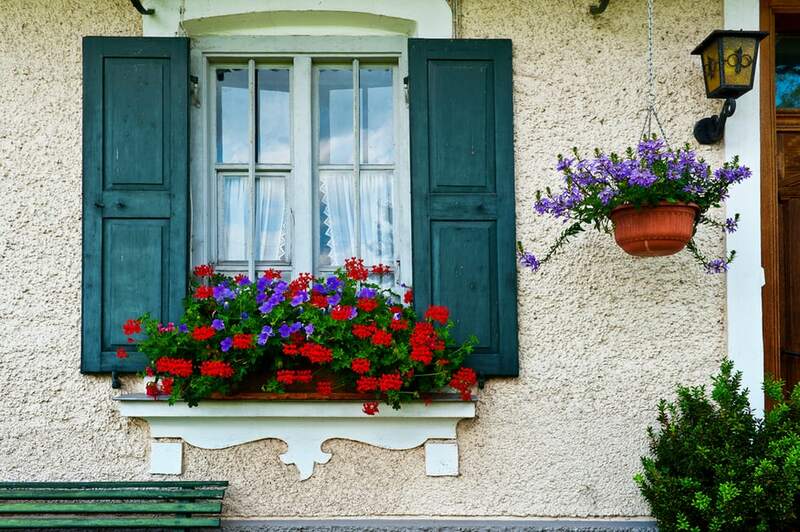 Adding a splash of floral color to the windows of your home, greenhouse, or shed, with a flower box is a wonderfully inexpensive way to brighten up your backyard. Intense shades, like the red and blue flowers in the photo, are eye-catching and sure to bring an extravagant appeal to your outdoor living space. Rope lights are simple to hang and create a magical nighttime experience in your backyard. They can be hanged from trees (like in the photo), around a garden structure such as a pergola, or wrapped around tree branches and trunks (similar to Christmas lights). For places with harsher weather, consider taking a look at our Outdoor Rope Lights article for more information! You can also add solar lights to your yard, which save you money and look great! See more ideas here. 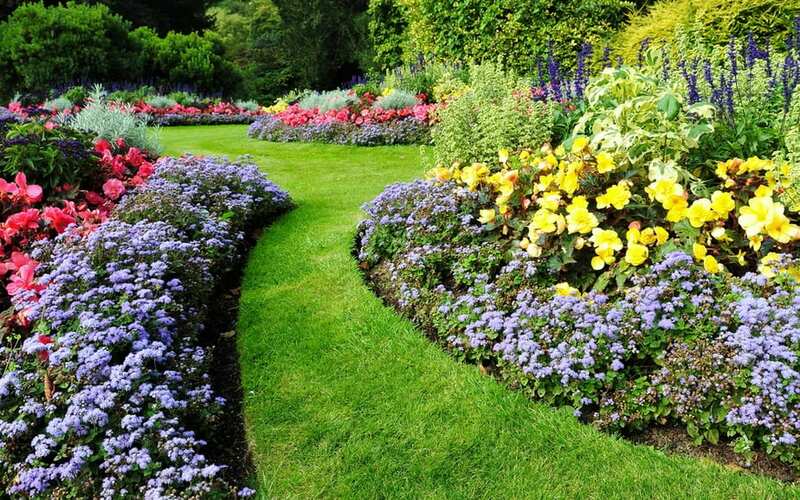 Garden borders create a landscape separation between your flower beds and yards that are pleasing to the eye (and easy on the wallet). 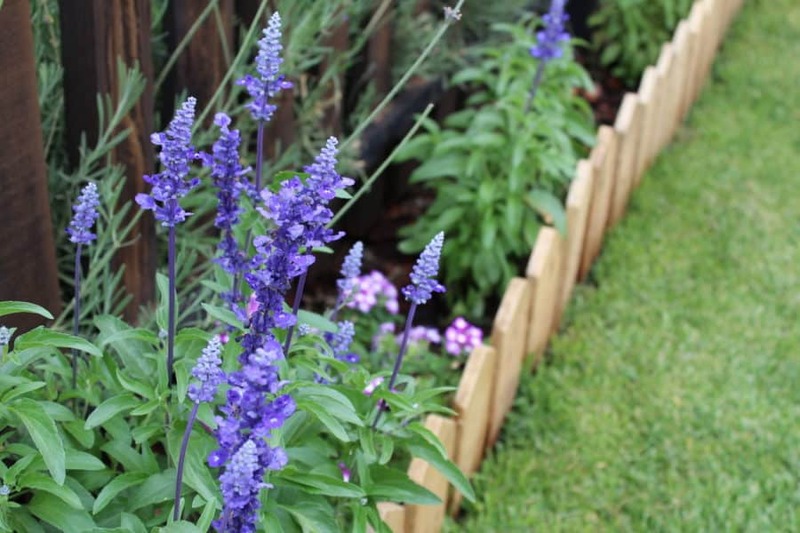 You can make – or buy – a garden border out of practically any material you’d like: small wooden fencing (shown in the photo), large rocks, pebbles, bricks, and whatever else you can dream up! 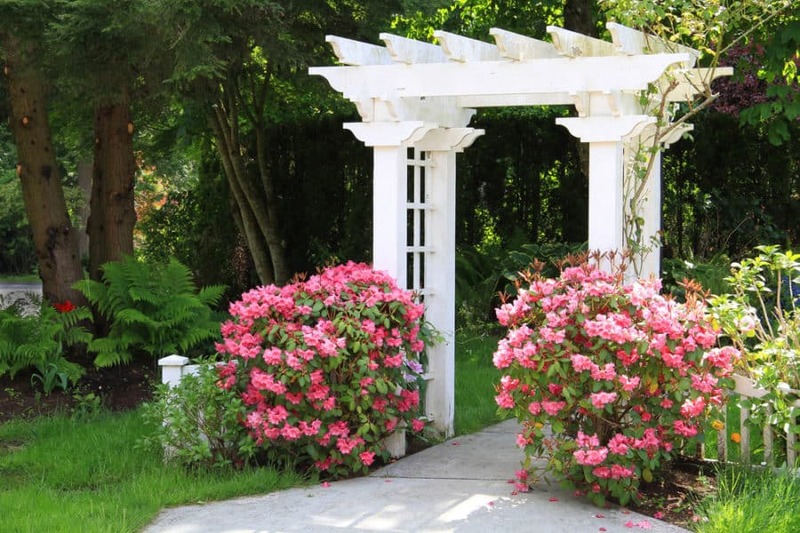 Arbors are a charming addition to any home yard. Their detail is often intricate, and they’re known for intensifying the beauty of lively gardens. Their barren features are truly striking, but they become even more elegant as the flowers and vines engulf their posts and beams. An absolutely adorable landscaping piece to add to your yard is a vintage wheelbarrow flower planter. 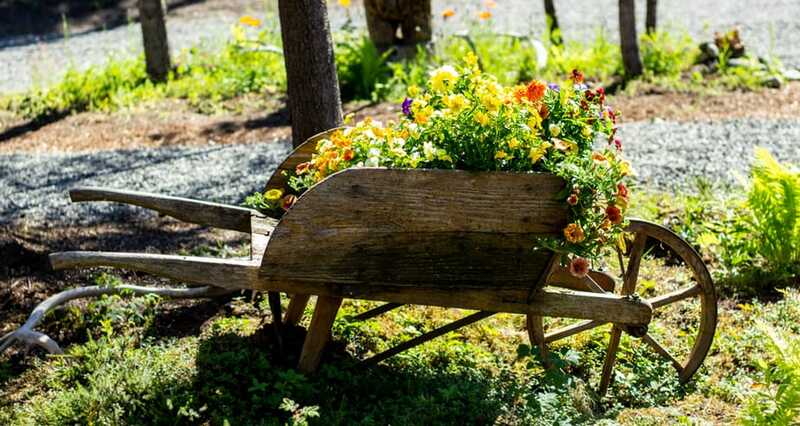 These not only save you money (if you happen to have an old wheelbarrow lying around or can make your own) but they also create a beautiful, rustic appearance that is sure to make your yard the talk of the town. Tree swings have been a common sight in home yards for decades (if not centuries). They bring an air of boy and girlhood to your backyard and are a fun, easy way to encourage the kids (or yourself) to spend more time outdoors. 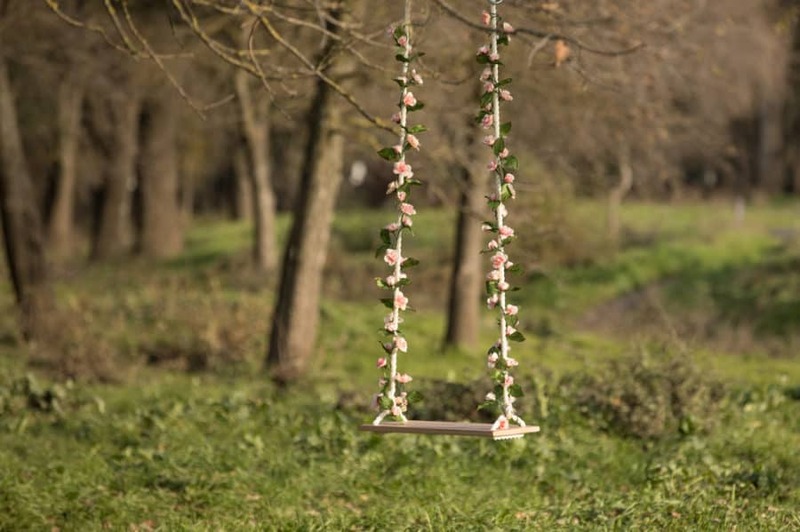 Tree swings are simple to make, and wrapping fake flowers around the ropes, similar to in the photo, can create a more delicate and storybook-like feminine aura. 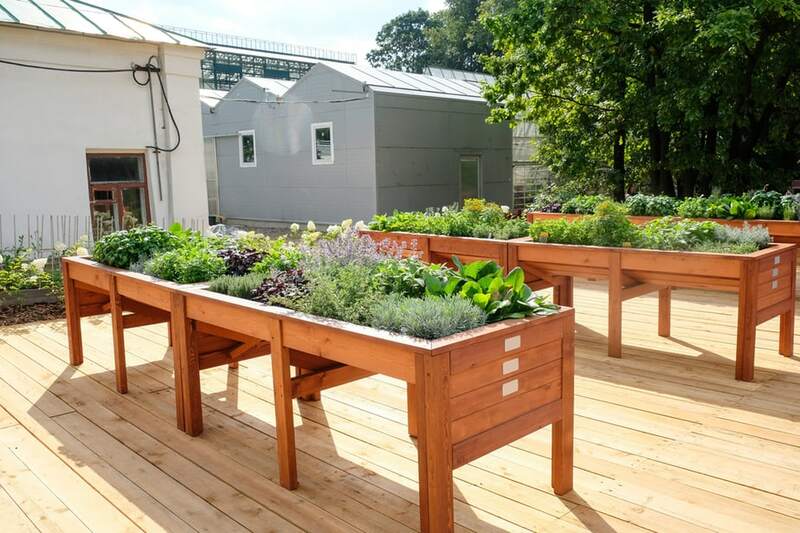 Raised garden beds have two main uses: acting as an interesting, hardly-ever-seen flower bed; and a great vegetable garden for those who may have trouble with ground-level edible gardens. They’re a rather simple DIY project for the crafty, and not too expensive if you purchase one. Whether you plan on building your own or purchasing one, raised garden beds are wonderfully useful, inexpensive, and visually stunning yard features (if you like a rustic look). Well, you don’t see these every day. Tire planters are probably the least expensive landscaping features you can put in your yard (one of the least expensive on our list, anyway). They’re cheap and easy to create on your own, too. All that’s required is that you paint, cut, or style your tire planter according to your preferences, hang (or sit) it in an area that you like, put some soil and plants in the casing, and voila – you’ve got yourself a tire planter. These little garden statues have been an adorable addition to yards and garden beds for decades. You’ve likely seen these at your grandmother’s home, – a welcoming sight at each visit. Wildlife statues bring the illusion of the cute, furry presence of animals without the sure damage of your petunias and vegetables by true wildlife. Adding a walkway is a great way to alter the appearance of your yard without breaking the bank. Stepping stone walkways, similar to in the photo are one of the least expensive options, considering they require far fewer rocks than other walkways do and have space between each stone. Putting stained mulch in your garden beds are an inexpensive way to set some color in your yard. Mulch can come in many different colors. The main and most popular colors are red (like in the photo above) and black. Mulch also comes in its natural wood-color that also makes gardens look more attractive (although the red and black stains really pop). 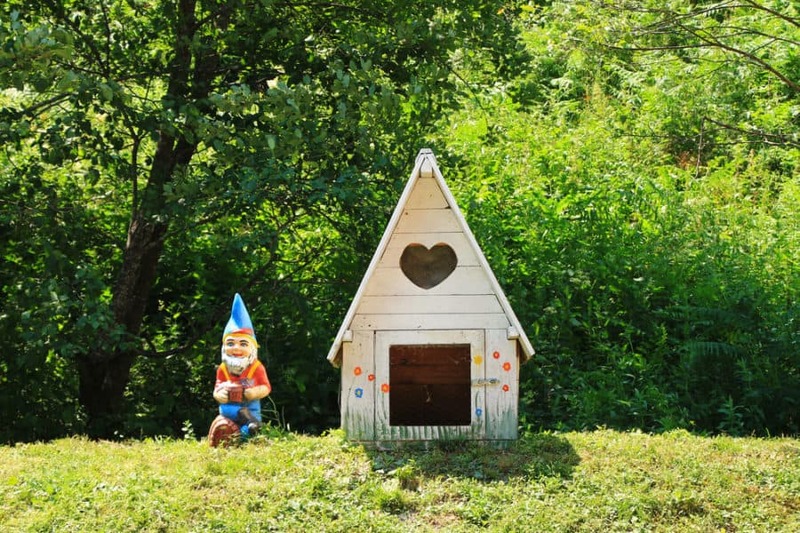 If you’re a flower garden-loving dog owner, this adorable A-framed “gnome’s home” dog house would be a precious way to turn your garden into storybook wonder. Not to mention it’d give your little dog a house to rest in when they’re spending time outdoors. This would be an especially fun project for DIY-ers and crafters. If you happen to have tree stumps lying around your yard, transforming them into a table and stools is an easy, do-it-yourself project that’s practical and unique. 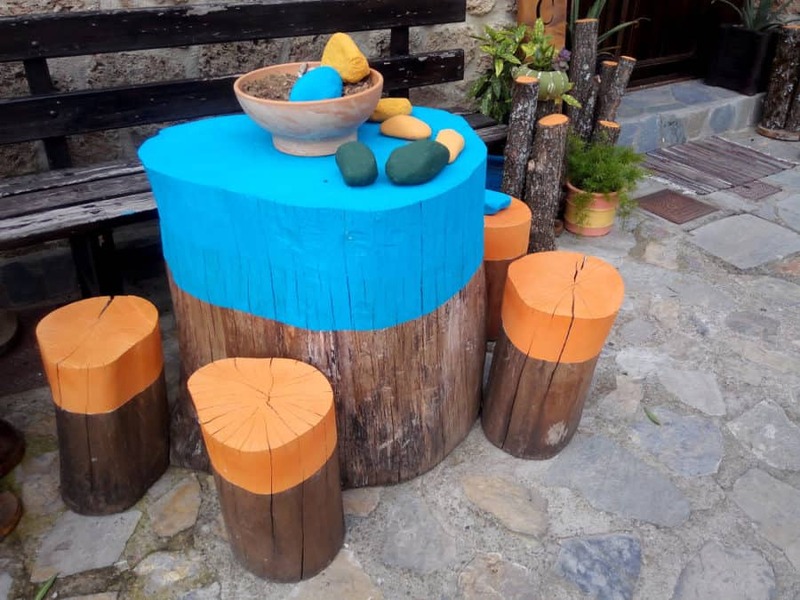 You can add some eye-catching paint to the stumps as well to make them even more appealing, like the tree stump table set in the photo. 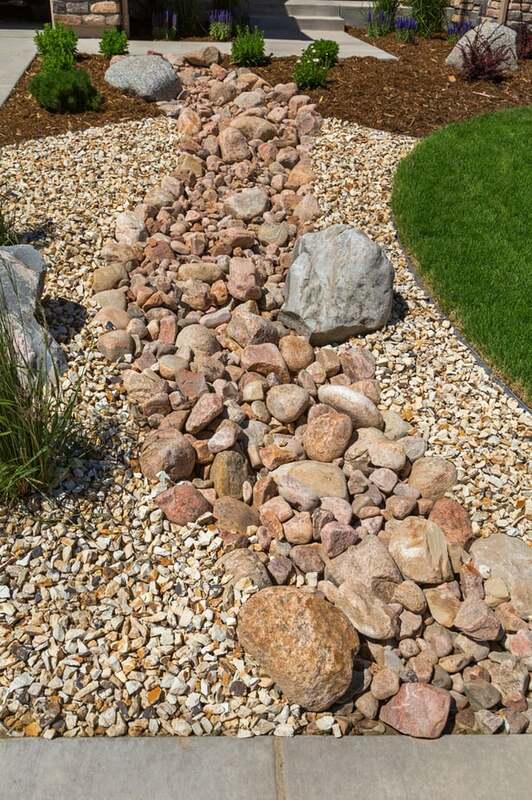 Dry river beds are a simple yard feature created with variously-sized and shaped stones and pebbles. The idea is to make it look as natural as possible, giving your backyard a woodland feel and appearance. There are many ways in which you can create these river beds, see how here. Birds are joyful creatures, constantly bringing the bright songs and colors they’ve been created with to our homes. This antique sink birdbath is a distinctive piece that’s sure to have all eyes on your garden, and petite, happy birds coming to make your home their own. 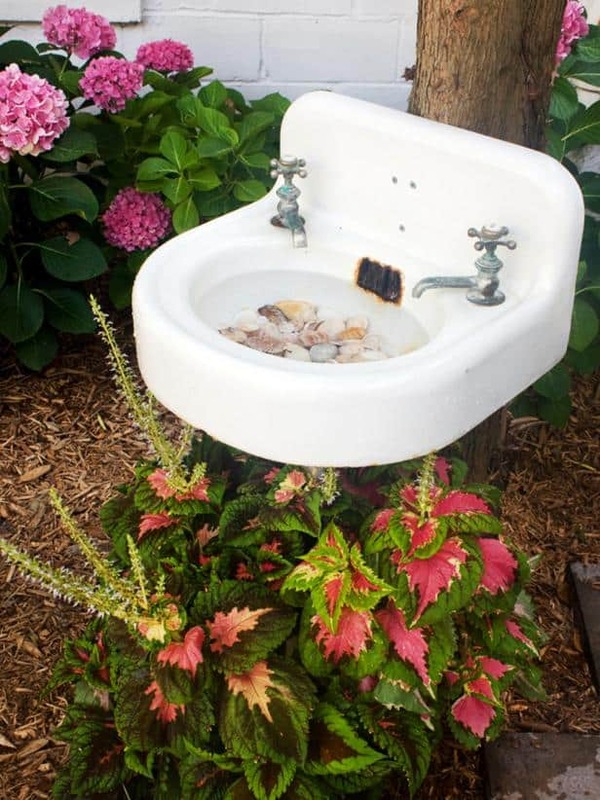 If the vintage sink isn’t quite your taste, any bowled antique piece will do; your imagination is the limit! It’s no secret that firepits can be expensive, especially if they’re intricately designed. If you’re one to enjoy a nice, warm fire on a chilly evening without the commitment or price of a permanent firepit, this homemade campfire firepit may be just the thing you’ve been looking for. The old-school build will bring summertime camp nostalgia to any yard and save you money in the process. 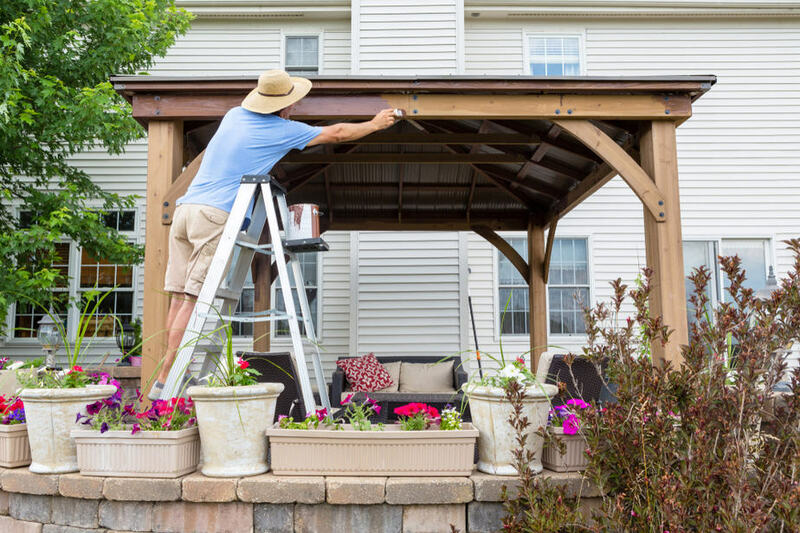 Yet another extremely simple way to alter your backyard is to repaint faded garden features, such as the pergola in the photo. You can paint the structures the vivid colors they were in their prime, or go wild and paint them vibrant colors you wouldn’t normally see in an average backyard. Either way, paint can do wonders in livening up your outdoor space. Plants are a signature method of turning a dull outdoor space into a colorful sanctuary. Flower pots are an average way to display nature’s beauty, but if you’re the creative type, a green wall made with wooden pallets may be more your style. They’re simple to make and are wonderful decor for the otherwise blank wall. Backyards with large dirt patches can be a pain. They look unsightly and are a hassle when it rains, and paving a large outdoor dirt space is costly. A cheaper alternative to concrete or stone patios is paving with gravel. Gravel is less expensive than more tailored options, easy to pour, and can be leveled out with a rake in no time. As we mentioned earlier, birds are a joyful sight in any yard. They bring life and songs wherever they go and are pleasant to watch on a weekend afternoon. Birdhouses with attached feeders are delightful and give your yard a sweet, old-timey aura (and birds a safe place to eat and make their homes). Antique chairs can often be found at garage sales or antique shops. They’re not hard to find, especially with the ongoing trend of decorating yards with such items. Decorating your yard with rustic seating is sure to bring the homey feeling of “yesterday” to your outdoor living space. Plus, the upkeep is little to none. Rust on these objects just adds to the appeal! Since we often view landscaping as being overly expensive, it can feel like a daunting task to change the appearance of your backyard. But landscaping doesn’t have to burn holes in your pockets; there are countless ways to modify the look of your home without spending too many pretty pennies. Seemingly small garden features like birdfeeders, antique seating and flower bed borders can truly transform the way your backyard looks! We hope you enjoyed our article covering our favorite backyard landscaping ideas on a budget and managed to come up with a few ideas of your own! Happy decorating!